One of my favorite activities to do in my classroom with my second graders each year was a book award based on the books in our classroom library. I liked to do this in March as a way to celebrate March is Reading Month but this would also be a great end of the year activity or voting season activity. It got my students excited about reading and rereading some of our favorite titles. It encouraged students to try a new book so that they could make the best decision when it came time to vote. To start, we would decide what categories we wanted to vote on as a class. Some years I would just pick the categories, other years I would let the students help decide. I kept it to six categories so that it wouldn't be too overwhelming. Once we picked the six categories (such as best series, favorite character, best read aloud, etc.) students would spend time with the classroom library trying to decide what books they wanted to nominate. Each child was given a nomination form in which they had to draw and write to explain what book they were nominating and why. I left this open ended and let each student pick any of the six categories to nominate a book from. I then printed and posted an awards nominee list. As a class, we went through each nomination form and added the books to the list. I would write in the book (and author when needed) and who nominated it. Once I'd gone through everyone's nomination form, we talked about other books we could add if any of the categories were lacking multiple titles. 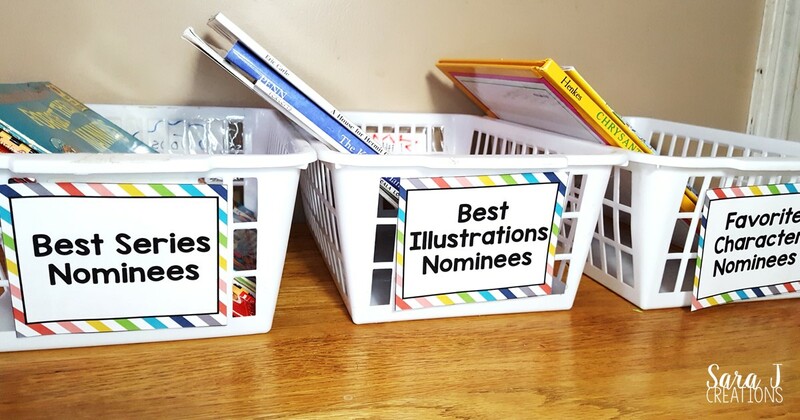 We gathered up the books that were nominated and kept them in special bins in the front of the room. During reading workshop or any free time when they were finished early, they were encouraged to read or reread as many of the nominated books as possible so that they could make an educated vote. If there were a lot of titles in one category, we would hold a primary election and narrow it down. We would also write persuasive articles trying to convince our classmates why they should vote a certain way. I liked for the final ballot to have 4-5 titles for each category. Once the election season was over (I gave them the month of March to work on this), we would pass out the final ballot. Everyone got to vote for one book for each category. You could go over the results together and turn it into a great data and graphing math lesson. I always like the anticipation that the kids had to find out the winner, so I would just count after school and announce the winners the next day. Once the winners were announced, I attached printable ribbons onto the winning books. I included what category the book won for and the year. You can do this a few different ways. You could print the awards onto full page labels and cut them out basically turning them into a sticker. Or you could print on paper and then use tape or contact paper to adhere it to the winning book. I liked to leave these on the books along with the year because it got students the following year asking questions about it and excited to vote for their own winners. I have my book awards available in my TeachersPayTeachers store. I've made the majority of it editable so you can make awards, ballots and labels that work for your students' favorite books. Download your own copy of Classroom Library Book Awards here. I would like to know appropriate books for 1st Grade for a classroom library? And an affordable way to obtain them for my class? I'm at a small Christian school. Thank you! I bought a lot of the books from my classroom library from ebay. Search Lot of Children's Books and you will find people that sell large amount of books for a discounted price. If I could get them for under a dollar a book I was happy. Also, public library book sales, garage sales, Goodwill, etc. will have discounted prices on books. I also got a lot through Scholastic. I would send home book orders and get points based on what my students ordered and then redeemed the points for books. If you are lucky enough to have a Scholastic warehouse by you, they have awesome sales there once or twice a year with deeply discounted titles. As far as appropriate books, some of my favorite authors or series for pictures books are Kevin Henke, Jan Brett, Eric Carle, Clifford, Berenstain Bears, Biscuit, and Pete the Cat. Easy readers would also be a good idea for 1st graders. And definitely some non fiction. Usually on topics that your students are interested in - animals, space, jobs, science topics,etc. Hope this helps!